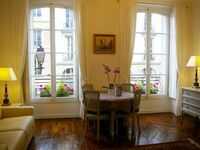 Beautiful hausmanian apartment in the chic 16th arrondissement. Quiet building. Property 13: Beautiful hausmanian apartment in the chic 16th arrondissement. Quiet building. 1 Bedroom And The Eiffel Tower! Property 25: 1 Bedroom And The Eiffel Tower! Rental 2 bedroom apartment standing near Eiffel tower . Property 41: Rental 2 bedroom apartment standing near Eiffel tower . Great place with a well appointed kitchen and light and cheery vibe. Very easy arrival instructions. Perfect location to explore the palace and gardens, and close to Le Potager du Roi, the King's kitchen garden and Parc Balbi, a couple of gems where you can avoid the crowds. Plenty of places to eat, as well as supermarket, bakery and wine store all within a block. Loved our stay great location.